MIDI Maze was an early first person shooter video game for the Atari ST developed by Xanth Software F/X, published by Hybrid Arts, and released around 1987. It owes a significant debt to what may be the first of its genre, Maze War. 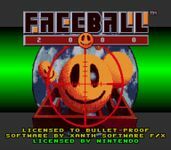 A Game Boy version was developed by the original developers, Xanth Software F/X, and published in 1991 by Bulletproof Software, now Blue Planet Software, under the title Faceball 2000. A SNES version, also programmed by Robert Champagne, was released the following year, supporting two players in split-screen mode. The SNES version substituted completely different graphics and levels from the earlier GameBoy version. Graphically the game was very simple with a humorous twist. The game area itself occupied only roughly a quarter of the screen and consisted of a first person view of a flat-shaded Pac-Man-like maze with a crosshair in the middle. All players were shown as smilies in various colors. Bullets were represented as small balls. Source: Wikipedia, "Faceball 2000", available under the CC-BY-SA License.